The first element influencing capacity is diameter. With automatic revolving doors, a larger diameter increases capacity (Figure 6). However, with manual revolving doors, increases in diameter generally work to increase user comfort, as they are intended for one user per compartment (Figure 7). The heavier weight of increased-diameter doors actually makes them slightly harder to push, lowering RPMs and thus slightly decreasing the number of people that move through. 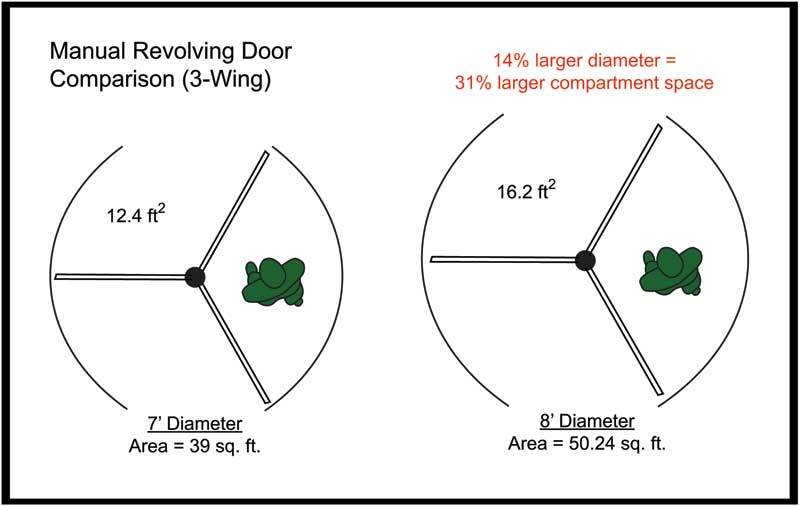 It is interesting to note when the diameter of a door is increased by a certain ratio, the area of each compartment increases by a much greater ratio. 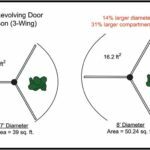 Thus, for a slightly wider opening in the building envelope, comfort and/or capacity can be greatly improved—this is especially true for automatic revolving doors. Another factor affecting capacity is the throat opening. By design, a four-wing door has a wider throat opening than a three-wing door of similar diameter. Since the wider throat opening is easier to pass through, it increases user comfort and capacity. 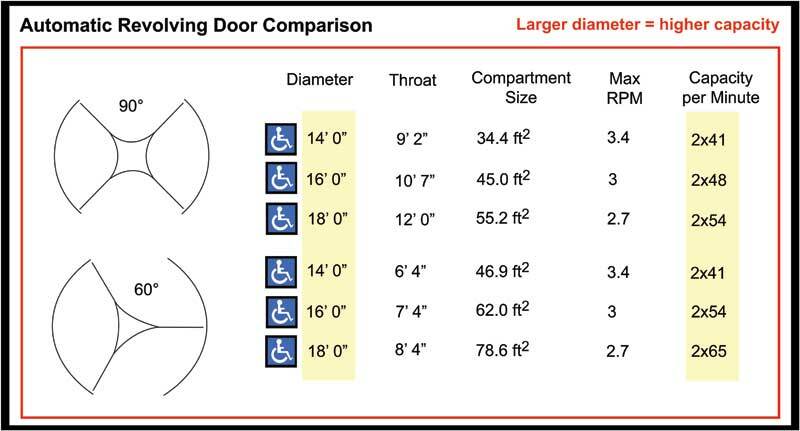 In smaller-diameter doors, the throat opening width becomes more of an influential factor in determining capacity. 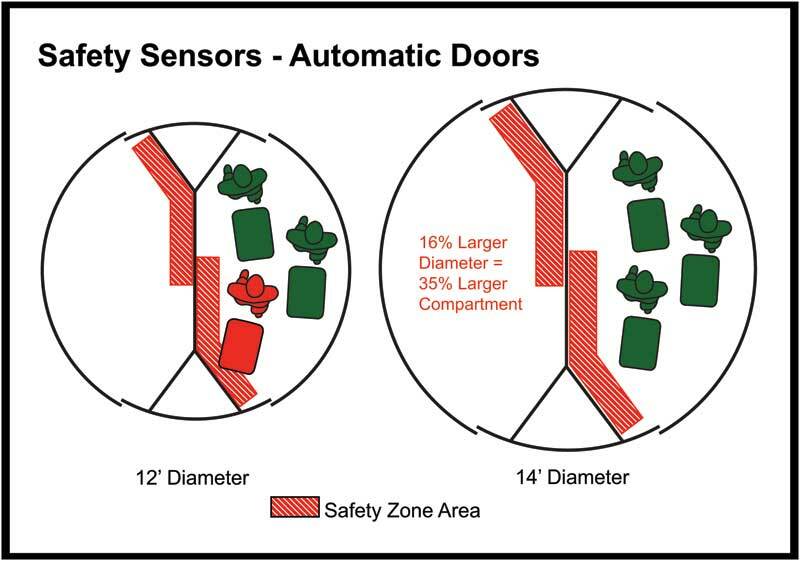 Another parameter to consider in determining capacity is whether manual or automatic doors are used. Automatic doors provide a hands-free experience for users pushing carts, strollers, or luggage, and are the logical choice in such cases. Manual doors are generally smaller in diameter (less than 3 m [10 ft]), designed to accommodate one person per compartment, and are most suitable for low-traffic applications. Cost is another factor in determining whether an automatic or manual door is selected. Building owners may prefer the lower price point coupled with the lower maintenance costs of a manual revolving door, compared to the higher price and maintenance costs of an automatic door. Finally, real estate constraints may limit the size of the door’s footprint. 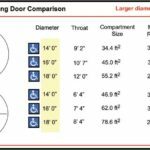 For example, in downtown areas where space is limited and/or expensive, putting in two manual doors may satisfy capacity needs where a single 3.5-m (12-ft) automatic door would not. 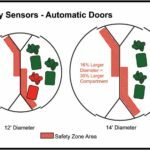 The capacity and safety of automatic revolving doors are enhanced by motion sensors, safety sensors on the top rail and right side of the throat opening to prevent contact, and rubber contact switches, which stop the door on contact (Figures 8 and 9). Designers should factor in how compartment size affects wheelchair access, rolling luggage, shopping carts, and emergency egress. While larger compartments generally afford more comfort or accommodate higher capacities, there may be caveats in certain situations. For example, if the application is a grocery store and carts are used all the time, the throughput will be reduced significantly. Additionally, the larger an automatic revolving door, the slower it rotates—flattening the curve on the correlation between throughput and compartment size. In manual revolving doors, an optional, low-energy positioning drive system will slowly rotate the door to the standard ‘X’ position after use, eliminating user confusion upon entering the door and enabling them to step in and keep pushing rather than hesitating. These same positioning drive systems may also incorporate a power-assist function that helps users push the door with reduced effort. 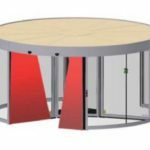 The advantages of low-energy positioning and power-assist are a greatly enhanced user experience compared to a plain manual revolving door.